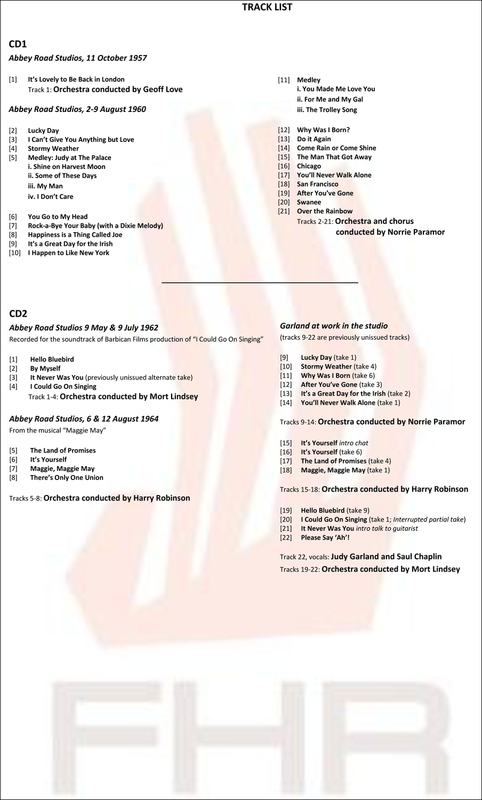 The track listing for the October release of “Judy Garland – The London Studio Recordings 1957-1964” has been announced. As noted before, included are 12 previously unreleased tracks, plus a newly discovered demo recording made by Judy and Saul Chaplin for I Could Go On Singing titled “Please Say Ah!” Some of these newly released alternate takes are evidently comprised of false starts, interrupted takes, and unfinished takes. No word on whether any of these are actually complete takes or not. This is definitely another “must have” for Garland audio fans. 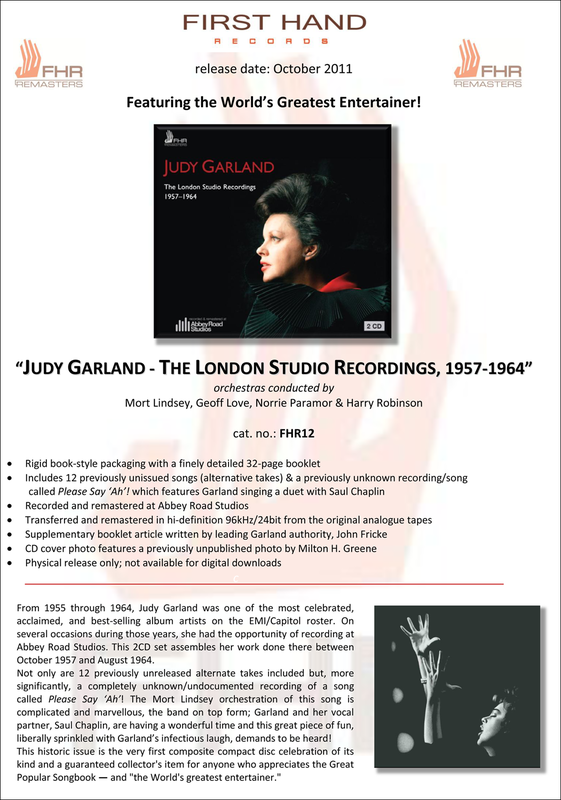 An alternate (take 1) was released on the 2007 “The Very Best of Judy Garland“ CD so this 2 CD set isn’t acomplete anthology of Judy’s London studio recordings. An alternate was released on the the 2006 “Essential Judy Garland” CD. Another alternate take was issued on the 2006 “Essential Judy Garland” and the 2007 “The Very Best of Judy Garland” CDs. I’m really excited about this release. It’s hard to believe that there is actually a “new” recording still out there. This is turning into a great year for Garland fans. I noticed some of the 1964 recordings were actually done on my birthday…not a big deal to most folks but kind of interesting to me…LOL. Thanks for all the hard work Scott and keep going strong!